Zeb Dennis coming through with a ton of dialed riding on street spots and skateparks! If you caught our Toronto X Jam photogalleries, you would have seen that Zeb was crushing the place all weekend. This video is no different… Watch as he puts in the work! Real good. “Zebo getting rad with a bunch of home town clips from last summer and some newer clips from the Toronto jam ramps! Here’s one we didn’t quite know what to expect going into it, but damn was it worth a look! Check out Zeb slaying rails, taking some big drops and putting his bag of tricks to real good use up in Canada. 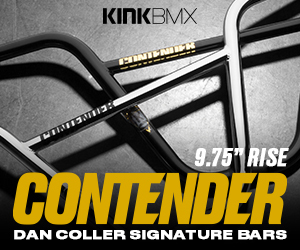 “Krusher BMX would like to welcome Zeb Dennis to the pro team. Between Zeb being a professional motocross racer and I running a business and working full time, we found time to make this happen. Filmed throughout South Western Ontario, Canada during the summer and fall of 2014. Thanks to Steven Moxley & Mitch Radcliffe for the tours in their cities. Welcome To Sleek Apparel – Zeb Dennis from Josh Mac Media on Vimeo. It’s been over a year since Zeb Dennis has had an edit come out, but if it took him that long to make this one, I’m ok with that! Zeb has a big bag of tricks, including amazing superman seat grabs and one handed heel clickers, which is a new one (for my eyes at least). Drew Bezanson tweeted the link to this video of Zeb Dennis, so I had a feeling it was going to be awesome before I even hit the play button. Zeb Dennis coming through with an awesome edit featuring him getting down on a few street spots and skateparks around Toronto this past summer. Definitely worth a look. Zeb Dennis spends some time cruising one of the best skateparks I’ve ever ridden in my time, Joyride 150, in Toronto for his latest edit. Fou words – bar to heel clicker! Awesome.